Steampunk your art with this narrow picture frame with black satin edges revealing an inner antiqued gold clockwork motif. Made from natural wood. Add a mat – or two – to create even more drama to your art prints or photos! My picture is 33" W by 22" H what size frame should I order? You should be ordering the frame to the size of your artwork. Do keep in mind the frames rabbet measurement. It is used to determine if your artwork will fit depth wise. 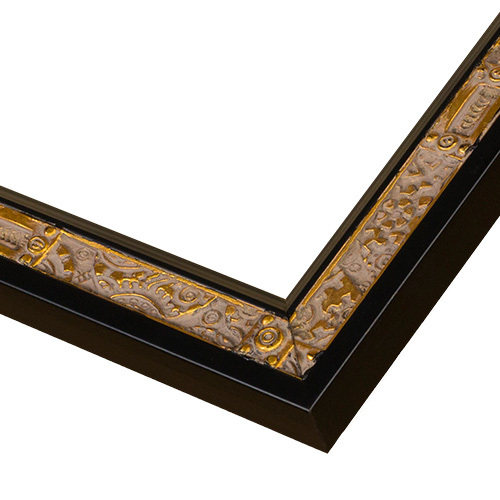 This frame has a rabbet of 1/2" so if you are framing a picture on paper this frame will work well for you. For paper prints, we encourage our customers to add an acrylic front & foamcore backing to the order to keep your artwork secure and protected. If you have any additional questions do not hesitate to contact our friendly framing experts at 1-800-332-8884. If you're just putting your picture into the frame without a mat, then order a 33x22" frame. If you're adding a mat, then the frame will need to be larger to accommodate it. Pictureframes does the math automatically when you choose to add a mat, but if you're buying your mat elsewhere, then you need to figure out the new dimensions depending on the width of the mat. Will a standard stretched canvas work with this frame? Thank you for your inquiry. This frame has a rabbet of 1/2", so as long as your canvas depth is 1/2" or smaller this frame will work for you. If you have any additional questions do not hesitate to contact our friendly framing experts at 1-800-332-8884.